Location: Pinacoteca di Brera, Milan. For more masterpieces, see: Famous Paintings Analyzed. One of the greatest Renaissance paintings of the quattrocento, this tempera painting by the Padua artist Andrea Mantegna is probably the most famous example of foreshortening in the history of art. Also known simply as The Dead Christ or The Lamentation, it shows the corpse of Christ lying on a marble slab, watched over by the grieving Virgin Mary and Saint John, who are weeping for his death. Unlike most religious art of the Early Renaissance, this is not an idealized portrait of Jesus: the nail holes in the hands and feet, the discolouration of the skin, and the dramatic perspective of the foreshortened body lend it a coldness and a realism belonging to the mortuary slab. Mantegna's adoptive father and teacher Francesco Squarcione (1395-1468), was a painter and antiquarian, and he instilled an interest in Greek sculpture in the young man, from which he developed his skill in modelling figures and his mastery of chiaroscuro. The exact date of the painting is unknown, although experts believe it probably dates back to the 1470s. If so, it must have remained in his workshop for around 30 years, which suggests it was probably painted for Mantegna's personal tomb in the chapel of San Andrea in Mantua. As it happened, it was discovered in his studio after his death and, after being displayed next to the coffin at his funeral, it was sold off to pay his creditors. Later purchased by Cardinal Sigismondo Gonzaga, it was acquired by the Pinacoteca di Brera, Milan, in 1824. It ranks alongside Masaccio's Holy Trinity (1428, Santa Maria Novella, Florence), Roger van der Weyden's Descent From the Cross (Deposition) (c.1435-40, Prado, Madrid), and Piero Della Francesca's Flagellation of Christ (1450-60, Galleria Nazionale delle Marche, Urbino) as one of the finest works of Christian art of the 15th century. A common theme in many religious paintings, the 'Lamentation Over the Dead Christ' is not a Biblical theme at all. It does not appear in any of the New Testament gospels, and only emerged as a devotional image during the 11th century. Other famous Lamentations include those by Giotto (Scrovegni Chapel, Padua), Botticelli (Munich), Annibale Carracci (National Gallery, London) and Rubens (Kunsthistorisches Museum, Vienna). Most Lamentations focus on the passionate grief being expressed by the mourners, but Mantegna's vision is quite different. His picture is defined from the outset by its window-like frame. This emphasizes the confined space of the scene and makes it appear even more like the cold slab of a morgue. 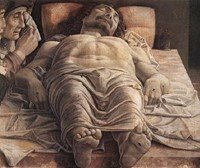 It also gives the viewer, positioned at Christ's feet, a dramatic close-up of Christ's dead body: the physicality and naturalism are extraordinary - it looks completely lifeless. The static nature of the body is further enhanced by a series of vertical and horizontal lines in the painting. The vertical ones comprise the position of the corpse, notably its arms and legs; and the right edge of the table. The horizontal ones are seen in the left/right axis of the pillow, the left/right flow of the shroud, and the bottom edge of the painting. These lines reinforce the stillness and immobility of Christ. Within this grid however, Mantegna creates an illusion of movement, of life. The weeping Mary is dabbing her eye with a handkerchief; the damp, bloody shroud swirls across the lower half of the picture. Even Christ's hair has a wild look. This contrasting appearance of motion helps to create a tension which attracts our attention, as do the elements which are visible only at second glance, like the face of Saint John (left edge), or the ointment container (top right). This uncomfortably realistic representation of death, further enhanced by the picture's muted colour scheme, and wax-like flesh tones, leaves no room for idealized musings or religious rhetoric. This picture is about the banal physicality of death - the end of earthly life. A fact and a prospect which is only relieved by our faith in God and a life after death. This may be the key message of the work. Mantegna's principal contribution to Early Renaissance painting was his mastery of trompe l'oeil spatial illusionism, exemplified by his foreshortening technique both in this painting and in his fresco painting on the ceiling of the Camera degli Sposi (room of the bride and groom) in the Ducal Palace, Mantua (1471-74). Foreshortening, namely the application of linear perspective to a single object or figure in order to simulate projection or depth (thus creating the illusion of three-dimensionality), helps to render the appearance of objects as we perceive them. Thus Mantegna's Christ is shown greatly truncated, even though the artist had to deliberately reduce the size of the feet so as not to obscure our view of the body. If a photograph had been taken from the same viewpoint, the feet would have blocked our view of the torso. Forty years before Mantegna completed Lamentation over the Dead Christ, Flemish masters like Jan van Eyck (1390-1441) and Roger Van der Weyden (1400-1464) were creating powerful examples of religious oil painting, in the form of altarpiece art and other works. Mantegna, however, like other Early Renaissance artists in Italy, preferred the medium of tempera painting, or fresco, although he did use oils from time to time. Here is a short selection of some of his best works in tempera. - St. Jerome in the Wilderness (c.1450) Sao Paulo Museum of Art. - The Adoration of the Shepherds (c.1452) Metropolitan Museum, New York. - Christ the Suffering Redeemer (14951500) State Art Museum, Copenhagen. - Agony in the Garden (c.1459) National Gallery, London. - Presentation at the Temple (c.1463) Staatliche Museen, Berlin. - St. George (c.1460) Gallerie dell'Accademia, Venice. - Adoration of the Magi (1462) Uffizi, Florence. - The Ascension (1462) Uffizi, Florence. - The Circumcision (14621464) Uffizi, Florence. - Madonna della Vittoria (1495) Louvre, Paris. - Holy Family (c. 14951500) Gemaldegalerie Alte Meister, Dresden. - Judith and Holofernes (1495) National Gallery of Art, Washington DC. - Trivulzio Madonna (1497) Museo Civico d'Arte Antica, Milan. Battle of San Romano (1438-55) National Gallery, London; Uffizi, Louvre, Paris. Brancacci Chapel frescoes (1424-8) Santa Maria del Carmine, Florence. Expulsion From the Garden of Eden (1425) Brancacci Chapel. Camera degli Sposi frescoes (1465-74) Ducal Palace, Mantua. La Primavera (1482-3) Uffizi Gallery, Florence. Birth of Venus (1484-6) Uffizi.  For more about Renaissance art of the 15th century, see our main index: Homepage.